This quilt greets you from Germany!! Angelika made this quilt, all out of plaids. Isn't it wonderful? And best of all, her HUSBAND quilted it for her!! I love it! Thank you, Angelika, for sharing this quilt with me, you made my day! Here is a close up of the quilting and pretty plaid fabrics. All this plaid makes me want to sew plaids, plaids, plaids!! So....I made string strips out of plaids...this was the most fun piecing I have had for such a long time! I can heartily recommend it for just fun piecing, without having to think much, LOL! Sometimes we can all use a break like that, right? Then I added the black strips on each side of the pieced rectangle. And added muslin triangles to finish the block. Pieces and parts of plaids...all I have left of the littlies went into these blocks. When I was little, I lived in Colorado, and was born there in the mountains. One trip I remember very well was a trip to Durango, Colorado, to ride the Narrow Gauge Railroad through the mountains to Silverton. It was the old train back then, before the new and improved version. Oh what a treat it was to me, to see those breathtaking mountains of home. Those mountains never fail to awe me, and seem to envelope me in a big hug when I get to go home. These blocks remind me of the old railroad tracks...so the name of this quilt is Narrow Gauge through the Rockies. 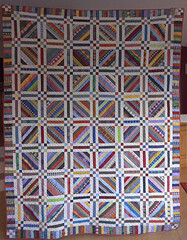 It is now short work of making the rest of the blocks, and putting it all together with a piano key scrappy plaid border. I have truly loved making this quilt!! A few more of these blocks...these take about 30 minutes each for me to make. Wonder why I am not faster at this? Some hand quilting on this...this quilt is just not straightened out, it is not this wonky! And a couple happy flower blocks!! I am having to take a review course, for CEU's to renew my CCRN certification. I attended a class today, and I learned a ton!! Just listened...and absorbed...and bound a quilt! I asked permission from the instructor before I did this...I did not want her to be offended at my quiet stitching. That's right, a whole quilt bound...it seemed like I learned more as I just relaxed and listened and bound! Wonder why? Is this the "Zen" state that people used to talk about? Anyway, it was a wonderfully productive day for me!! Finishing things, and a brand new bag! Do you ever get an idea, from a previous quilt? 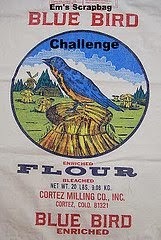 I made a wonderful table topper from Marcie Patch's pattern this week, and then got to thinkin'...how about making a bag with strings and this pattern? So here it is!! I am not going to use it for a while, I will just admire it until I am ready to change purses. I truly love sewing my scraps into something useful!! I am working on finishing some things up. This is an overwhelming task, but little by little, I am persevering!! Hope you have a great day today, everyone!! Well, I am slowly working on my Sister's choice blocks. I do love working with my scraps!! Seems like I have lots of pink...LOL!! I have been saving the connector triangles and making pinwheels from them...maybe a border for something? Hmmmm...one quilt inspires another!! All these blocks are pretty much caught up and sewn together. I still have some stitching to do, and I am hand blanket stitching the applique pieces. These are fun!! And easy...just right for a portable project for me with the waiting, waiting, waiting at the hospital this last week. And binding on this!! This quilt just makes me smile...tiny pieces, and all scraps! Hundreds of different fabrics...what is not to love about using these old friend fabrics in a fun quilt?!! I am so saddened by the Boston Marathon bombing. I was working at the hospital, when my friends rushed to my patient's room and said "turn on the news!" The patient, nurses, doctors, aides, secretaries...we all looked on in horror at the horrible scene. The best thing? Because there is always a best thing in any situation...people ran TOWARD the scene to help!! I was so lightened and touched by that...everyday heroes!!! Thank you, each one of you, for helping, for stepping forward and running to help. Bless you!! We have a gentleman, very wrinkled and grey, who has been faithfully treading our hospital halls for two weeks now. Of course I stopped to chat...his wife is in the hospital with heart surgery. He shared that they have been married 56 years now, and that she is his whole world. Love, love, love....LOVE that!! And a Patchalot quilt!!! 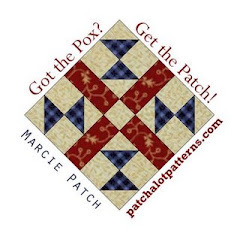 Marcie at Patchalot patterns makes the cutest and most wonderful patterns! My colors were from the stash, so they are different from hers. Her quilt is so very cute!! Please see her website HERE! I do love this little birdie! Marcie is having a buy one, get one deal going on right now...don't miss out! What makes this quilt even more special is that these blocks in the middle were gifted to me, from my friend Joyce in Arizona. I love them! Well, we were the recipients of hospital care, on my floor this week. For some time, my husband has had more chest pain. He always wrote it off as indigestion, or lifting too much, or general tiredness (does this sound familiar to any of you ladies? )...but this week, he finally agreed to come to the hospital and see just what it was. How to do that? A heart cath...and low and behold, he had a 90% blockage and a 70% blockage. The interventional cardiologist was able to open the arteries up and stent them to keep them open. My thanks to our God and to all the wonderful docs and nurses who blessed us so much this week. My DH is home, and while he still has some chest pain, he feels better...and I am so very glad for this. No bypass, at least for now, and we are so grateful! He eats well, and has very few risk factors, but that genetic component is there...he eats very well, but has decided to once and for all become vegan. In support of him, I will be eating mostly veggies too. I will let you know how that goes!! In light of all that has happened this couple weeks, I am woefully behind on replies and such..I ask for your forgiveness and please know that I will catch up!! Now for the fun stuff!! The book giveaway from a couple postings ago!! KaHolly!! Robert from Northern Iowa! You have both won a book, please e-mail me your address and I will zip them out to you! Garden of threads!! All these comments were randomly selected to win a pin from Jennifer. Please e-mail me and I will send out your pins!! Happy Tuesday!! I have always loved the Sister's Choice quilt on Bonnie Hunter's Quiltville site. So, I made a start...one block. Then...I just had to know what 1/2 size blocks would look like. So, I made a little quilt from these blocks. All out of the 1.5 inch strip bin. These fabrics are old friends...some VERY old friends...like 20 years old, LOL! And another little quilt. This one is a Lori Smith pattern, from a book I lent out from the library. The book is called "Fat Quarter Quilting", and it has so many cute small quilt patterns. I renewed it...again...love it!! It rained off and on today, and the same is to happen tomorrow. I got some housework done, and piddled around with the above little quilts. I am finding that I have way too much stimulation...too many quilts I want to make. I need to find a way to filter all this stimuli a little better and concentrate on one thing at a time. Please tell me you do this too, LOL! ?? Time to make some tracks on the big Sister's Choice blocks!! Good Monday to everyone!! I am off work, and didn't even get a call to come in...wow! A real day off! I have been enjoying the above...the latest paperback from Jennifer Chiaverini! Many of you enjoy her novels, and I do too. So....here is your chance to receive one of these copies of her book, "The Giving Quilt". Just leave me a comment, and I will ship anywhere in the world! This one is a good one, as all Jennifer's books are. This is near and dear subject to so many of us, as quilters, as giving people...about Project Linus and giving to others. You will really enjoy this book, and I found it a fun and uplifting read. 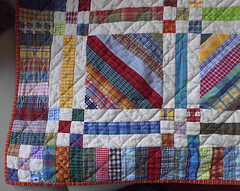 "At Elm Creek Manor, the circle of quilters, is hard at work preparing for "Quiltsgiving." Held annually the week after Thanksgiving, expert and novice quilters from near and far gather for a special winter session of quilt camp to make pieces for Project Linus. As the week unfolds, the quilters respond to the question, "why do you give?" in ways as varied as the life experiences that drew them to Elm Creek Manor. Each of the quilters, including a librarian, a teacher, a college student, and a quilt shop clerk uses her unique talents to teach, inspire and give back to her fellow campers." So there it is in a nutshell, folks...please leave a comment and one of these books and pins can be yours. I will draw by random number on Friday, the 5th.